The latest wave of unfavorable domestic economic reports seems to have negatively affected U.S. auto sales, according to The Washington Post. Domestic sales during July are expected to fall to a 13.8 million annual rate, down from a 14.1 million annual rate during June, according to the report. Although the summer sales trend seems to be cooling off slightly, there is still some good news for domestic manufacturers. CBS News released an independent study that showcased five U.S. cars that rank among the highest in quality and reliability, according to several agencies. 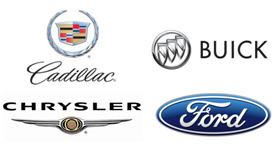 The Cadillac CTS, Buick LaCrosse, Ford Flex, Chrysler 300 and Ford Focus were included in the list. Automobile.com commissioned a user survey to determine the average cost to insure these vehicles. According to the survey, the Ford Focus is the cheapest vehicle to insure at an average of $747 annually. The Buick LaCrosse came in second at $814, the Cadillac CTS was third at $890 and the Chrysler 300 averaged $1052. The average cost to insure the Ford Flex was undetermined due to insufficient responses. A recent Automobile.com article compared the cost to insure the "Big Three" American carmakers. For the purpose of the study, drivers of Chevrolet (a General Motors brand), Ford and Chrysler vehicles provided the amount spent on insuring their respective vehicles annually. The survey concluded all three automakers compete closely, with less than a $50 separating the least expensive from the most expensive. Some industry analysts have a more positive outlook on U.S. vehicle sales for the remaining months of 2012. According to the AP, Edmunds.com is predicting an annual sales rate of 14 million. Automobile.com recommends drivers regularly compare car insurance quotes to ensure they are receiving the lowest rates. Using a resource such as Automobile.com that is unaffiliated with specific auto insurance companies or automakers allows consumers to receive unbiased information and quotes.